Forget apples. Instead, it's a glass of red wine a day that may keep the doctor away. Studies show red wine may protect the heart and help control cholesterol levels, among other benefits. And these protective qualities have been mostly attributed to two components in red wine: the alcohol and the grape's antioxidants. The French may be on to something: Despite a diet heavy in saturated fats (think: rich cheeses and buttery croissants), French rates of obesity and heart disease are relatively low, causing researches to ponder the connection between the French fondness for red wine and the French Paradox. Moderate alcohol consumption—that's one drink per day for women, two for men—is shown to reduce risk of heart disease, stroke, and may even reduce the likelihood of developing diabetes. In some studies, moderate drinkers were associated with the lowest mortality rates. Alcoholic beverages, including wine, are credited with increasing "good" HDL cholesterol levels (HDL cholesterol basically acts like the body's maintenance crew; scavenging and removing LDL, or "bad," cholesterol). But cholesterol levels are only half of the equation. 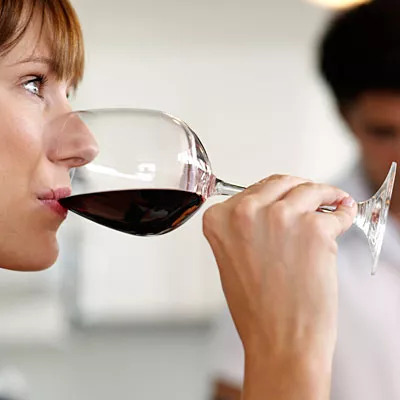 Red wine's antioxidants (resveratrol, to be exact) may also provide protection against problems with blood flow to the brain, possibly preventing stroke (though the research is currently based on rats, so results may vary for humans). The grape itself is responsible for two of red wine's star antioxidants: resveratrol in the skin and proanthocyanidin in the seed. So why are these little guys so important? Antioxidants help protect the body's cells against free radical damage, a type of oxidative stress, which can be a precursor to diseases like heart disease, Parkinson's, and Alzheimer's. Wine can also increase life span by inducing longevity genes. One study even suggested moderate amounts of red wine and purple grape juice be included in the five to seven daily servings of fruits and vegetables recommended by the American Heart Association. But remain wary: the bulk of these pro-wine studies were done on mice or rats and not verified on humans (yet). Plus, the mice weren't lucky enough to drink actual wine—just fed high doses of pure resveratrol far larger than a human could get from drinking any reasonable amount of wine. Not a fan of red? While it lacks the resveratrol present in red wine, white wine, might be just as protective of the heart and—even the lungs—as long as it's rich in other antioxidants like tyrosol and hydroxytyrosol. But, alas, all wines are not created equal. Dark red wines made from grapes with thick skin have the most resveratrol. Other antioxidant winners include Cabernet Sauvignon, Pinor Noir, and Chardonnay. Don't drink (or simply can't stand) either? Consider purple grape juice or a resveratrol supplement to reap similar benefits. One thing to keep in mind: one serving of wine is only five ounces. Drinking the whole bottle doesn't double (or quadruple) the benefits, and drinking too much can lead to cancers and other diseases. Like any indulgence, moderation is key: the USDA recommends no more than five ounces for women and ten ounces for men per day. With these limitations in mind, go grab that glass. Salut! *Note: The original version of this story appeared on May 27, 2011. In January 2012, a researcher of red wine whose findings were used in the original article was accused of fraudulent research on the subject. All research by this scientist originally cited in this article has since been removed and replaced.